Conveniently located at Edmonton Trail and 36th Ave. N.E. Our shop hours are 7:00 am - 6:00 pm Monday to Thursday and until 12pm (Noon) Fridays. 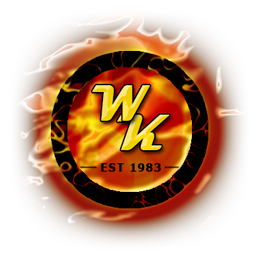 We Kare Automotive has been an established business at the same location for 35 years. Our quality assurance is our guarantee of our customers satisfaction for all of your automotive needs. We utilize industry standard practices, equipment and quality parts. Call for an appointment anytime at (403) 276-4654. Our facility is equipped with state of the industry equipment and diagnostic tools. We offer a safe, convenient and comfortable atmosphere. Our technical staff is fully bonded and insured so you are assured of reliable and satisfactory automotive mechanical repair. At We Kare Automotive, we strive to be your approachable, reliable and affordable automotive repair facility. Looking for a solution to your automotive needs? We provide "Solutions"! Should your personal, company or fleet vehicles still be under manufacturer warranty We Kare Automotive offers complete maintenance and diagnostic services and repairs. We use factory fluids, parts and components so your warranty is never affected. If a warranty or recall issue does arise we'll always refer you to the appropriate dealership with all the necessary documentation.
. Oil, lube & filter $39.20 + parts. Air filter/synthetic/diesel oil extra. Vehicle Safety Inspection included.
. Brakes $156.80 front or rear pads and rotors. Plus parts. Brake fluid service included.
. Tire Installation, clean, seal & balance $25.00/tire. Mag-coated weights, extra. We Kare Automotive Services has been in the business of automotive repair and maintenance since 1983. That's a long time of committed service to all of our satisfied customers. Normally, within a day of your vehicle arriving at our shop, we get your vehicle in, diagnosed and order parts as fast as we can. In most circumstances we can provide next day service by appointment, no problem. No matter how busy we are we'll always take the time to speak with you regarding your automotive service needs. Expecting quality services is something we understand and are committed to. Call for an appointment or to speak with us anytime at (403) 276-4654. We're open from 7am to 6pm four days a week (Monday to Thursday) and until Noon on Fridays. Will the Repair be Covered by Warranty? Warranty coverage varies depending on components and individual manufacturer warranty provisions. In most cases, however, responding sooner rather than later is likely to minimize your owner's repair liability. With the addition of our new factory manufacturers scanning tools we can accurately diagnose factory warranted parts, components and fluids and refer you to an appropriate dealership with all of the necessary documentation. That's if you really have to take it to them at all. We're a Quality Certified shop and offer complete solutions to your automotive repairs, maintenance and diagnostics. We Kare offers a 2 year and/or 20K warranty for parts and labour (prorated - parts subject to manufacturer warranty ). Minor Problems? Major Repairs! We're prepared for that. In 1996 the EPA mandated that the computer interface for all vehicles sold meet a common standard. An inherent solution for many independent automotive repair facilities that couldn't afford to purchase a half-dozen scan tools for "on-board diagnostics" (OBD) for each brand of car worked on. So far so good, right? But, independent shops often use generic or multi-manufacturer scan tools. One tool, most vehicles. Somewhat limiting as to what systems they can address and may have no access to body controls, air bags, evaporative systems, warning lights resets, or other programming requirements. That's not us! In an ever increasingly difficult diagnostic environment having complete and accurate data, both live and recorded, will quickly isolate any particular problems with a more accurate repair. The addition of manufacturers factory scan tools offers an alternative to dealer only services. Our new factory manufacturers scan tools can diagnose quickly and efficiently many small problems that may become major headaches. We now cover most Domestic, European and Foreign vehicles from 1996 to 2011. Accessing on-board diagnostics or OBD monitors the performance of many major engine components, including individual emission controls. By giving us early warnings this protects not only the environment but also identifies minor problems before they become major repair liabilities. For example, by identifying a relatively inexpensive repair like the replacement of a malfunctioning oxygen sensor saves you the cost of replacing a catalytic converter later. By helping to ensure that the vehicle operates within its original design specifications we can help you save money by making sure gasoline isn't wasted as a result of a loose gas cap or incomplete combustion. Yup, we're saving you money right there, quickly and efficiently. Tune-ups are kind of outdated these days because computer systems self-correct the fuel mixture and ignition at every crankshaft revolution. OBD stores information about the malfunction detected and actually helps the repair technician to diagnose and fix the vehicle. When OBD checks are performed as part of a state's Inspection and Maintenance (I/M) program, they can help save consumers time, taking on average five minutes or less in centralized programs. Are Repair Costs Going to Increase? Ummm...No! Real world experience from utilizing such scan tools has shown that the average cost reflected is more efficient than those associated with repairs of more traditional testing such as tail-pipe testing. Regardless of the test used to identify a failure, it is standard operating procedure for a repair technician to consult a vehicle's OBD system before attempting a repair. In fact, the automotive community has been using information provided by OBD systems to diagnose and repair vehicles for more than twenty years facilitating quicker diagnoses and cost-effective repairs not possible with conventional diagnostics systems. Several factors contribute to high repair costs, but the most powerful appears to be the weather, which can affect some of the most expensive parts of the car to replace, or simply create a climate (so to speak) in which car owners turn up most regularly at repair shops. Ten percent of drivers are tooling around with their check-engine light illuminated; half ignore the warning for at least three months. As drivers hang onto their cars longer, the average age of a car on the road is now over 11 years old, the more likely they are to need new oxygen sensors and catalytic converters, the most common repairs. Manufacturer Scan Tools: An early warning of trouble.
. Turn off the "check engine light"
. Compatibility with the widest range of vehicles. 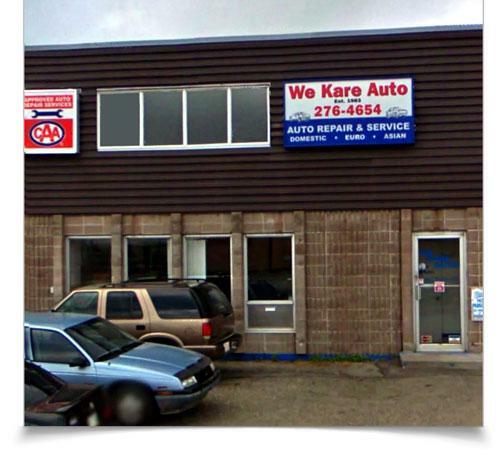 We Kare Automotive is conveniently at #431 36th Avenue N.E. half a block west off of Edmonton Trail N.E., Calgary Alberta. We are open bright and early Monday to Thursday at 7:00 a.m. until 6:00 p.m. and until noon (12pm) on Fridays. We're pretty approachable at We Kare Automotive and understand that "funny sound" or "is that supposed to work like that" kind of questions are best conveyed in person. Drop in? Drop off? Get to work! We make dropping your vehicle off for repair or servicing very easy. Calgary Transit bus routes are only a block away heading North or South into the Calgary downtown core. Busses arrive roughly 15 minutes apart and South into downtown is only about 20 minutes away (give or take traffic conditions). Route #5 Stop # 5259 "North Haven" North Bound Edmonton Trail at 36th Avenue N.E. Route #4 "Huntington" Stop # 5275 South Bound Edmonton Trail at 35th Avenue N.E. Call us. We're confident of our work and understand that sometimes our customers have concerns regarding their vehicles on the spur of the moment. Calling us to set your mind at ease is really alright. After all, your satisfaction is our guarantee. Please call us at (403) 276-4654 for any questions about your vehicle, anytime between 7:00 a.m. to 6:00 p.m. weekdays. Picking up your vehicle and paying for service or repair work? We are open until 6:00 p.m. Monday to Thursday, (Fridays until 12:00 - noon) but if you're running a little late that's OK. We understand that working until 5:00 and trying to pick up your vehicle can be difficult. We'll wait. We also have a secured key drop off right by the front door for weekends, late nights, towed in vehicles and for those really early risers. We Kare Automotive accepts Visa and MasterCard as well as your banks debit cards. We provide you with a complete detailed invoice for all of the parts, labour and services that your vehicle required. Oh, and of course we also accept cash payments. Don't you have a name? We'll need one. Car Broke? Need a Boost? Emergency Towing & More with our friends at "Forest Lawn Towing" (403) 265-0440! Traffic SNARLS? Get to where you're going with Calgary Traffic Maps. We Kare, on the road with you to keep you safe. Seasonal weather can change in an instant. Be prepared for Safety NOT Rescue! Check your weather driving conditions NOW!